The book is a fun read, but not one I would urge you to run out and buy if you don’t have the time or inclination. It’s actually more about productivity and is one of the better ones I have read, but half of it was dedicated to asserting the validity of the ideas – which was too much for me (I was sold at the title!). Since it is part of our mission at the Whisperer to do this sort of reading for you, I sifted through it for nuggets of goodness to share. How many biros do you have on your desk? Looking at the photo above I have 7 – why? I type most of the time. One biro is all I need. That box of paperclips? I don’t print stuff out so I never use them – likewise the stapler (which I don’t think works anyway). There’s a bunch of DVDs, a child’s folding toy, a cap, a box of old business cards with the wrong phone number of them (why?? 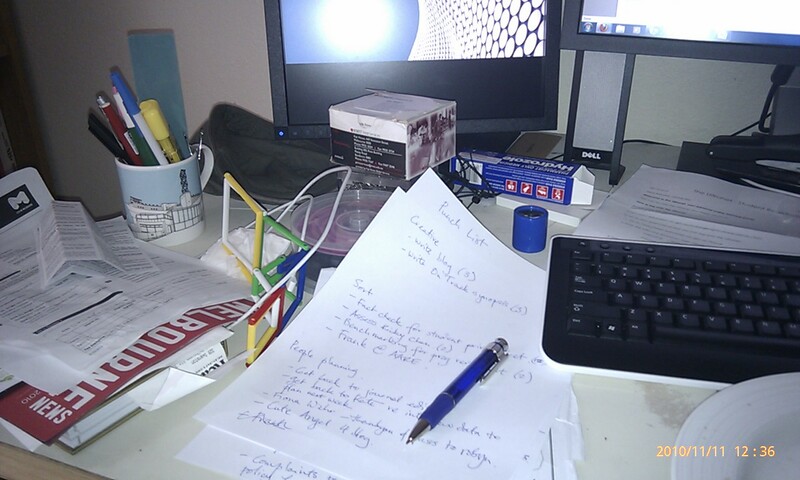 )… But the biggest problem on my desk is that pile of paper on the left. There’s a parking permit form (I don’t have a car! ), a list of instructions for the skin cream for my son’s eczema (note empty box), an old bank statement, a couple of tax receipts and the ‘melbourne magazine’. Ah – much better. All I have is functional biros and markers, my notes, a book and my phone/gadget cords. It’s not impersonal, just efficient (I kept the photos of my son tucked under the monitor) and it took less than 4 and a half minutes to achieve. Already I feel like a more organised and purposeful person. Ok, so most of the stuff ended up in a box on the floor, but the book told me to leave it there for 10 days and only take out the stuff I need to use. By the end of 10 days I will know what should have a permanent spot and what should be thrown out or put elsewhere. I’m a busy, engaged sort of person. I always have a few pots on the boil and many of these projects involve small details – ring someone back, supply someone with something, think about an idea – you know the sort of thing. It’s taken me a long time to realise that most research work is just bits of this kind of detail, in endless motion. When details are in my head they have to compete for attention with what I will eat for lunch, what I think of Bruno Latour, my sprained little toe and so on. The details tend to get lost in the fog, where they lurk leading to feelings of – you guessed it – Guilt. I spent an hour putting what was in my head into a big list, which acted like the desk clean up. It’s not a to-do list – that would be too confronting. It’s more like an inventory of what I have going on in work and in life. I think the most useful idea in the book was how to use productivity cycles. The authors claim that your work day starts with a short ‘problem solving window’ (or ‘the hour of power’). The next block of time till lunchtime is good creative time – a place to wrestle with new ideas. After lunch most people’s brains tend to go into a bit of a slump, so this time is good for ‘sorting’, mechanical and repetitious tasks. Towards the end of the day you tend to pick up a bit, so this is good for dealing with people and planning. I don’t know about you, but I never believe that my body works like other people’s, but clearly it does. I used the hour of power to solve my biggest problem – getting on top of my inventory. Then I employed the ‘creative time’ to a creative problem and I made more progress than I have for a month. Colour me amazed. Now I know that this works for me I will say ‘no’ to morning meetings! The authors claim that 20 minutes is about all you can expect to spend intensely concentrating on something before taking a break. I find it’s task dependent and that I can write for at least an hour before I start to fade. Either way, planning to take a short break every 20 minutes means that you can goof off a bit and recharge as you go. Armed with this knowledge you can plan your time in four chunks along 20 minute intervals: Problem solving, Creativity, Sort and People and Planning. Use the inventory to break off tasks, estimate how many 20 min chunks you think you will need to achieve them, and then write a ‘punch list’. For researchers the hour of power and the creative time will be most important to plan. Cross it off as you go for a feeling of achievement. Theobald and Cooper claim that before going home each night, a punch list for the next day should be written. This entry was posted in Book Reviews, Getting things done. Bookmark the permalink. Thankyou Inger, its great to be reminded of those tasks you know how to do but ignore. I tried your detox last Friday. I spent 6 hours clearing the desk and dealing with a lot of outstanding and guilty jobs not done. One was to reply to the scholarship feedback that should have been done in October. The clean up was like a colon irrigation. I then sorted my emails into folders which I do only sometimes. I then got some quotes outstanding for my body corporate and on it went. I could not stop. Eventually really exhausted that night I sent off 2 pieces of writing that I had to do. On Saturday I cleaned the house and all the stuff I had been tripping over on the floor which is my very big “to do” box has been sorted. I then cleaned the shower and bathroom and made an appointment to see a dear friend in a nursing home who I last saw 6 weeks ago. I also got the car serviced today and I have now done 3 1xhour walks (every second day) and intend to keep it up. All the sitting at the computer is interfering with my hip ligaments and I need to exercise to keep my back in shape. I have made a punch list and keep adding to it. So you have inspired me. Thankyou for reading the book for me as I just don’t have time and thankyou for invigorating my desk and house and life. Wow Sarah – it’s comments like this that make the time I spend on the Whisperer worthwhile! Great advice – thanks! 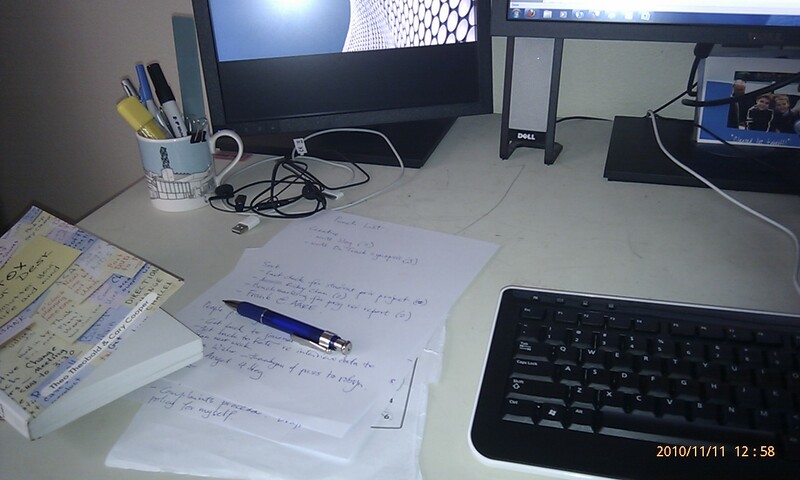 I’m going to de-clutter my desks this weekend (home desk) and first thing monday morning (work desk).